Meteorologists with the U.S. Air Force 45th Weather Squadron are monitoring conditions in the launch area. The current weather prediction is 90 percent “go” at launch time. Hello and good afternoon from NASA’s Kennedy Space Center in Florida. It’s a beautiful, sunny day on the space coast. A SpaceX Falcon 9 rocket and Dragon spacecraft stand ready for liftoff, at Space Launch Complex 40 at Cape Canaveral Air Force Station. Launch is targeted for 1:16 p.m. EST today, with an instantaneous launch window. The Falcon 9 rocket went vertical this morning and weather is 90 percent favorable at launch time. Dragon’s internal countdown is running and propellant loading is underway. Today’s launch is a cross-country effort. Launch controllers at the Florida spaceport are working in concert with teams at NASA’s Johnson Space Center in Houston and SpaceX’s control center in Hawthorne, California. The launch blog originates from the NASA News Center here at Kennedy, a few miles west of the launch complex. SpaceX CRS-16: What’s on Board? Robotic Refueling Mission 3 (RRM3) is an exterior payload on the International Space Station, RRM3 will demonstrate innovative methods to store and replenish cryogenic fluids in space. These fluids have chemical and physical properties that make them useful for spaceflight, but storing them is tricky because they boil off over time. In addition to replenishing cryogenic fluid, RRM3 will store it for six months with zero boil off to demonstrate the efficient use of these important consumables. RRM3 builds on two previous robotic refueling technology demonstrations–RRM1 and RRM2. Not only could these technologies make refueling spacecraft in orbit possible, but the resulting capabilities also could be applied to exploration missions to the Moon and Mars. Read more at https://sspd.gsfc.nasa.gov/RRM3.html. The Global Ecosystem Dynamics Investigation (GEDI) provides high-quality laser ranging observations of the Earth’s forests and topography required to advance the understanding of important carbon and water cycling processes, biodiversity, and habitat. GEDI is mounted on the Japanese Experiment Module’s Exposed Facility (JEM-EF) and provides the first high-resolution observations of forest vertical structure at a global scale. These observations quantify the aboveground carbon stored in vegetation and changes that result from vegetation disturbance and recovery, the potential for forests to sequester carbon in the future, and habitat structure and its influence on habitat quality and biodiversity. 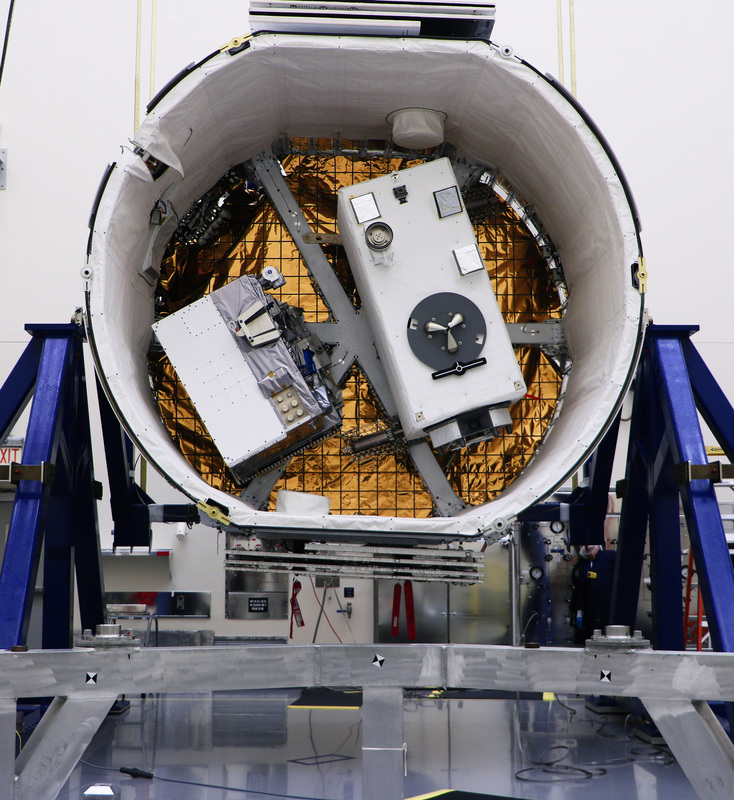 SEOPS’ SlingShot is a small satellite deployment system delivered by Dragon that fits inside the Cygnus spacecraft’s Passive Common Berthing Mechanism. The space station crew will install the SlingShot deployer and controller prior to Cygnus’s unberthing and departure. SlingShot can accommodate up to 18 CubeSat satellites of any format. After Cygnus is released from the station, the spacecraft navigates to an altitude of 280 – 310 miles (an orbit higher than the space station) to deploy the satellites. 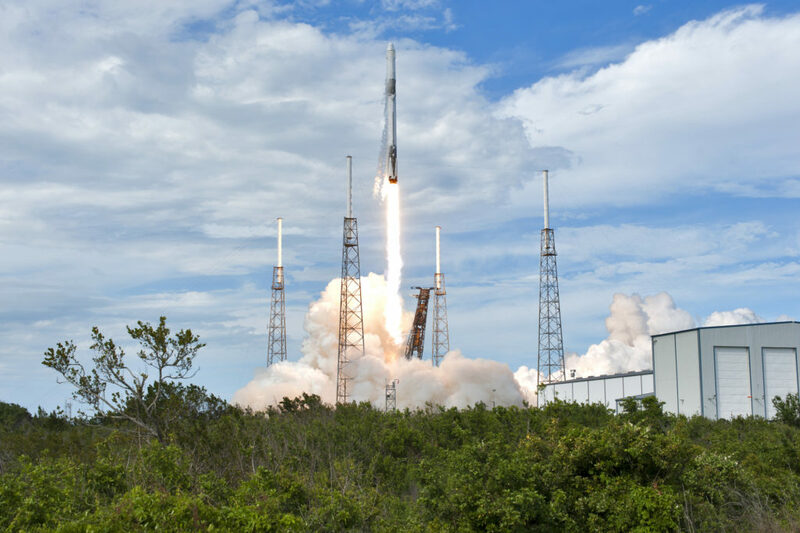 Author Linda HerridgePosted on December 5, 2018 December 5, 2018 Categories Cargo Resupply (CRS)Leave a comment on SpaceX CRS-16: What’s on Board? 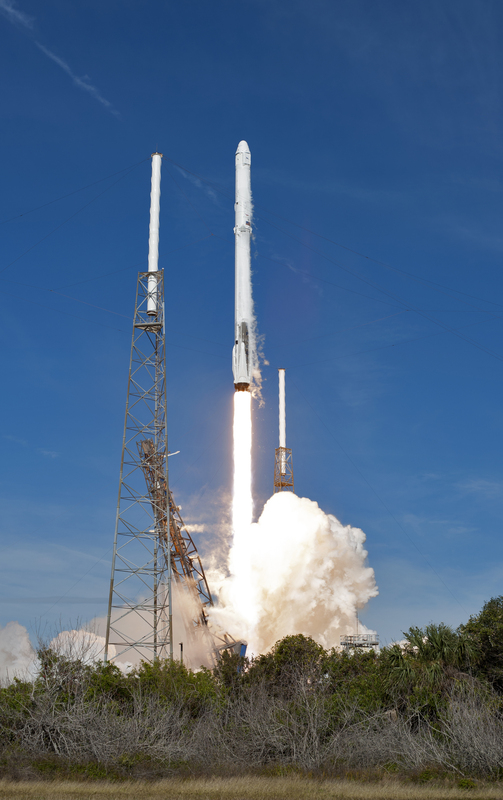 A SpaceX Falcon 9 rocket soars upward after lifting off from Space Launch Complex 40 at Cape Canaveral Air Force Station in Florida on April 2, 2018, at 4:30 p.m. EDT, carrying the SpaceX Dragon resupply spacecraft. 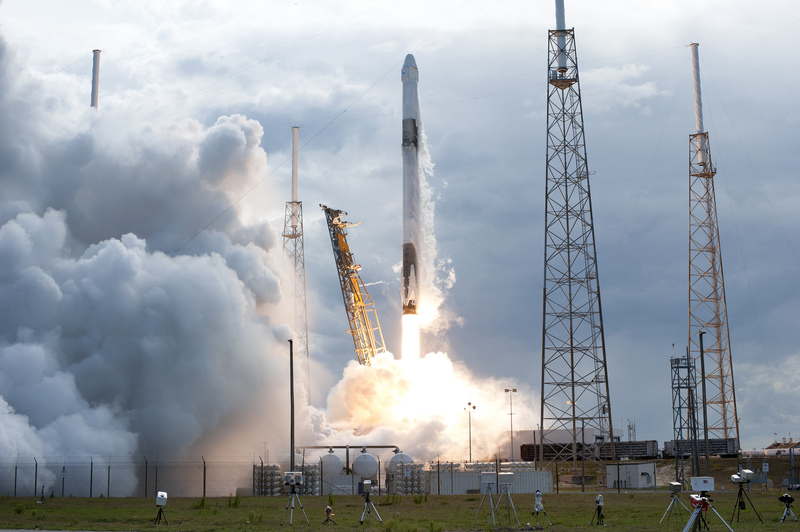 On its 14th commercial resupply services mission for NASA, Dragon delivered supplies, equipment and new science experiments for technology research to the space station. 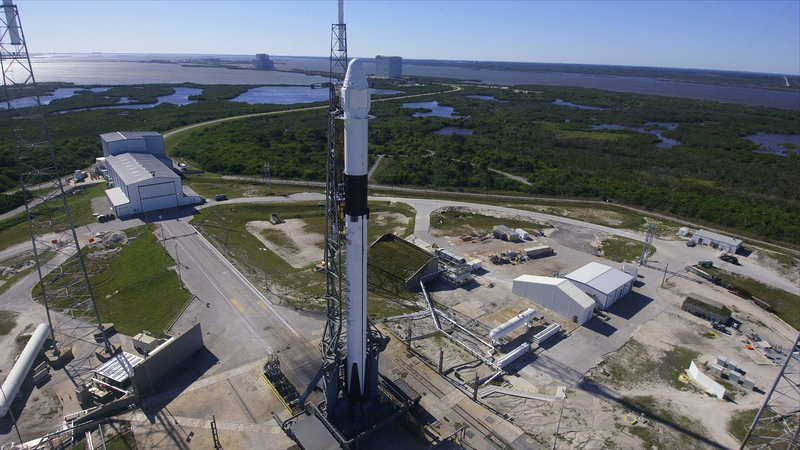 The rocket awaiting launch this afternoon is the SpaceX Falcon 9, a two-stage vehicle topped by the company’s uncrewed Dragon spacecraft. 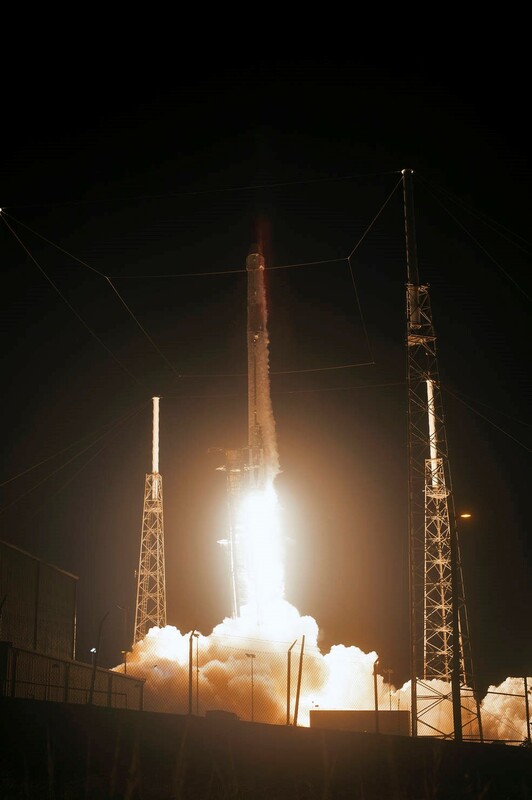 The Falcon 9 first stage, a new booster for this mission, is powered by nine Merlin engines that ignite at T-0. Its second stage has a single Merlin engine that takes over after separation of the first stage. Merlin engines, also built by SpaceX, run on a combination of cryogenic liquid oxygen and a refined kerosene fuel called RP-1. Installed atop the rocket, the Dragon spacecraft, last used for SpaceX CRS-10 in February 2017, is loaded with cargo bound for the International Space Station. The Dragon offers a pressurized section as well as an unpressurized “trunk” section for additional cargo. Also located in the trunk are the spacecraft’s power-producing solar arrays, which will open shortly after Dragon arrives in orbit. 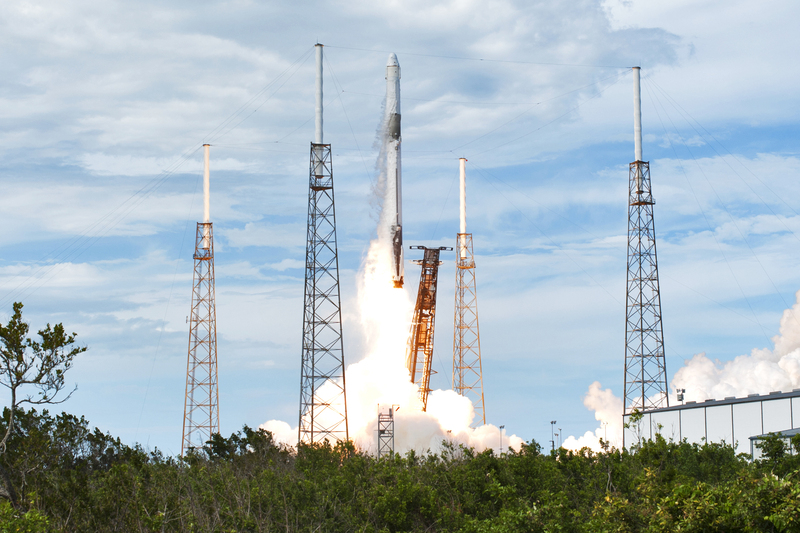 Liftoff of a SpaceX Falcon 9 rocket and Dragon spacecraft is targeted for 1:16 p.m. EST today. Countdown activities are in progress at Space Launch Complex 40 at Cape Canaveral Air Force Station in Florida, where the rocket awaits launch on the company’s 16th commercial resupply mission to the International Space Station. 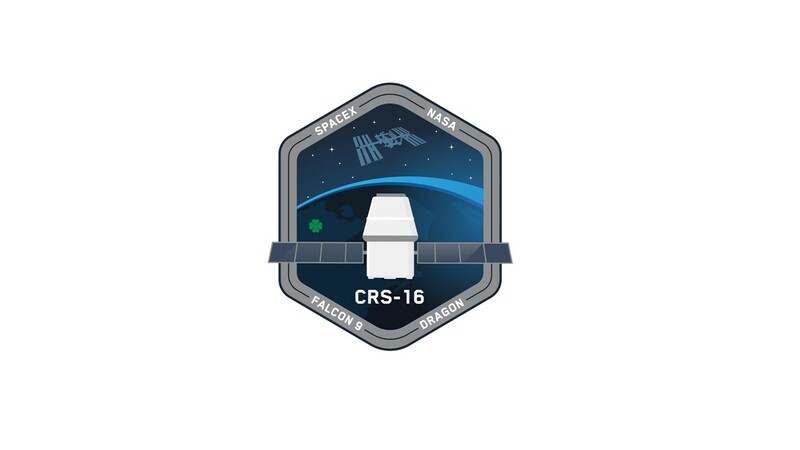 CRS-16 is the sixth U.S. resupply mission to the space station, and the fourth resupply mission for SpaceX this year. Be sure to join us here on the blog and on NASA Television beginning at 12:45 p.m. for updates from the countdown. Learn more about the SpaceX CRS-16 mission by going to the mission home page at http://www.nasa.gov/spacex. 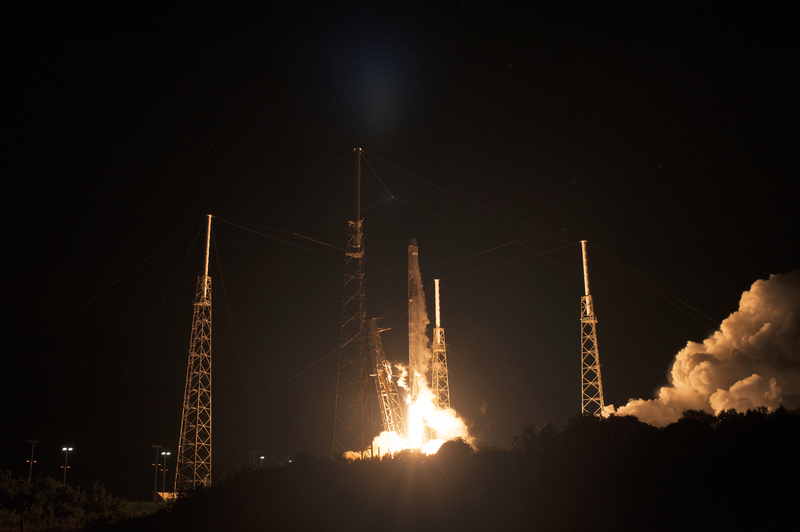 Meteorologists with the U.S. Air Force 45th Space Wing predict a 90 percent chance of favorable weather for liftoff of the SpaceX Falcon 9 rocket for the company’s 16th commercial resupply services mission to the International Space Station. Launch is scheduled for Wednesday, Dec 5 at 1:16 p.m. EST from Space Launch Complex 40 at Cape Canaveral Air Force Station in Florida. On launch day, the primary weather concern is liftoff winds. SpaceX’s 16th commercial resupply mission to the International Space Station for NASA is targeted to launch at 1:39 p.m. EST Tuesday, Dec. 4, from Space Launch Complex 40 at Cape Canaveral Air Force Station in Florida. Join us Monday, Dec. 3, as we start SpaceX CRS-16 launch week coverage with prelaunch events on NASA Television and the agency’s website.